Just over a thousand feet south of the Museum of Science and Industry sits Jackson Park’s Wooded Island. 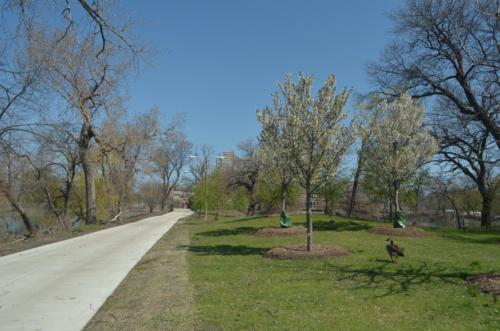 In April of 2015, the United States Army Corps of Engineers (USACE), in partnership with the Chicago Park District, began an $8.1 million restoration of Jackson Park. USACE falls under the purview of the Department of Defense, and builds military facilities, civil engineering projects, and other public works. This restoration project means Wooded Island could be closed for as long as five years until 2020—sad news, since the site is home to the popular Osaka Gardens and acts as both a birdwatcher’s paradise and local fishing spot. Like many parts of Jackson Park, Wooded Island persists as a historical remnant of the fairgrounds at the 1893 World’s Columbian Exposition. Before the renovation began in 2015, local residents could be seen fishing for catfish to take home and eat. As a part of the ongoing restoration, many trees have been removed and the lagoon was drained for a period of six months. Umek claims the level of animal diversity since the restoration began has been comparable to that of previous years, with over one hundred species observed. From January to April 2016, on the fourth Saturday of every month, the chain-link fence surrounding Wooded Island opened its south entrance to the public. 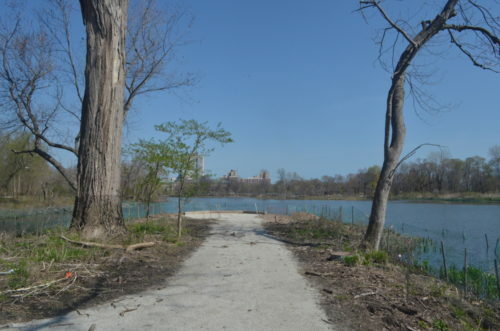 In April, The Weekly took a guided tour of Wooded Island, learned about the work being done there, and met community members who shared memories of the old Wooded Island as well as criticisms over the Chicago Park District’s vision of Jackson Park as an urban dream. 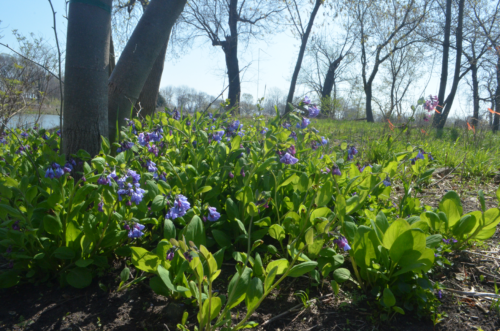 The city of Chicago is utilizing a cost-share model to fund the restoration. USACE will front sixty-five percent of the cost, while the Park District will cover the remaining thirty-five percent. The nonprofit organization Project 120, notable for its desire to implement a music pavilion behind the Museum of Science and Industry, will supply a portion of the Park District’s contribution. Applied Ecological Services (AES) is the contractor for the project, responsible for planting and implementing much of the restoration. However, this plan is not without its critics: the Jackson Park Watch, an activist organization of community residents who want more community input in plans for the park, are critical of Project 120’s plans to build a concert pavilion behind MSI. 1. Our tour guide was Lauren Umek, a project manager with the Chicago Park District (CPD) working on the Wooded Island restoration. Umek is trained as a plant and soil ecologist, and is a PhD candidate at Northwestern. 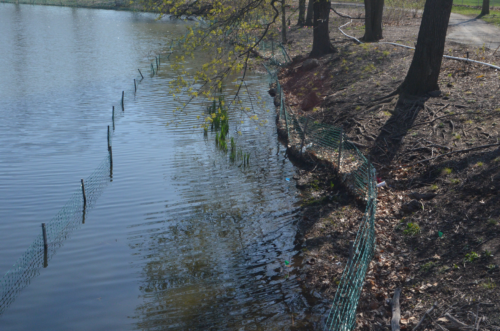 She calls the green fences that surround the entire lagoon “hideous.” These temporary herbivory fences are part of contractor AES’s attempt to fulfill their contractual obligation to plant sustainable flora: about ninety percent of the plants AES plants have to survive, or else the organization will have to pay to replace them. While planting season ideally takes place during spring and fall, the contractors have been working year-round to meet their goals of approximately 600,000 plants. In order to do so, they have been pumping water from the lagoon via temporary irrigation pipes. The native plants have deep roots, averaging six to twelve feet, so that once they establish themselves they can survive any number of droughts and floods. 2. 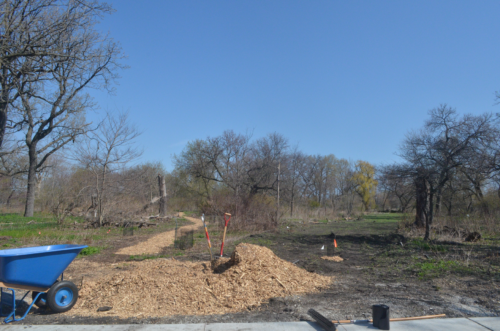 Part of the agreement between the Chicago Park District and AES included navigating the conflict between ecological restoration and design. 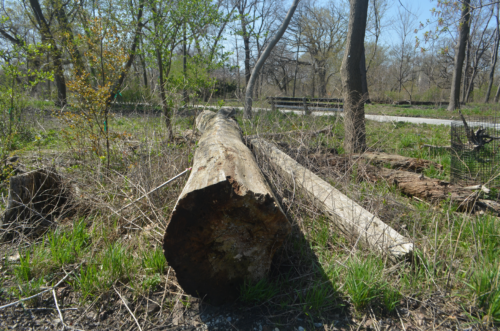 That tension manifested in the contract’s mandate that all oaks—deemed a keystone species worthy of special protection by the Chicago Park District—larger than twenty-three inches in diameter be preserved. At the same time, the contract demanded that all previous asphalt be replaced with concrete. Unfortunately, the heavy equipment that typically accompanies concretizing an area can do great damage to oaks, some of which are the oldest in the city. AES solved this problem by building a temporary path running through most of Wooded Island. 3. In an attempt to achieve a balance of aesthetic urban park design and flourishing ecosystems, much thought went into every dead tree left in Wooded Island. In the early stages of the restoration, they mapped the location of every dead tree, judging which ones could stay on the basis of aesthetic appeal, safety, and ecological consequences. The contractors also conducted prescribed burns to rejuvenate and encourage a healthy ecosystem. These burns only affect smaller, herbaceous plants, and not more native grasses and fire-resistant trees such as the oak. Whether these burns will produce a significant effect on the Wooded Island ecosystem has yet to be seen. 5. This overlook presents a view of the back of the Museum of Science and Industry and the larger Columbia Basin behind it. Historical placement (as well as Frederick Law Olmsted’s intentions when he redesigned Jackson Park three times—before, during, and after the World’s Fair) influenced the location of the nine overlooks throughout Wooded Island. This particular overlook speaks to Olmsted’s vision of open water, different textures, different heights of trees, and different colors all combining to create a specific experience for the nature-seeking city-dweller. 6. The restoration of Wooded Island is slated to take a maximum of five years; the project is currently in its second year. The contract between the Park District and AES required that no planting be done on the island in the first year of restoration. During this time period, AES instead focused on removing invasive species, including the mulberry, which is a good tree for local resident birds looking to nest. Even after the removal of dead trees, they were interested in how changes to the canopy would affect land plants’ ability to grow. 7. Volunteers led by Park Steward Jerry Levy play a significant role on Wooded Island, which has had work-days every fourth Saturday of the month. 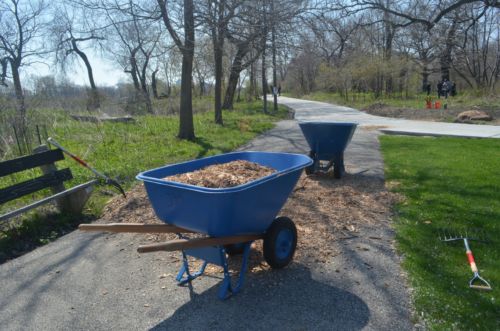 Volunteer duties include placing cages around baby oaks and pulling out weeds of non-native species, such as garlic mustard. 8. 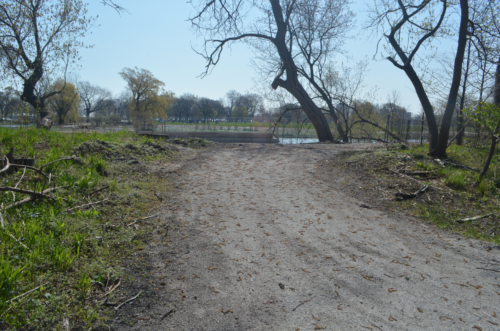 The current five-year project to restore Wooded Island is only Phase One of a multi-phase plan by the Chicago Park District to restore all of Jackson Park. For the foreseeable future, however, the park will not have funding to go beyond this first phase. The Clarence Darrow Bridge, which is owned by the Chicago Department of Transportation and not the Park District, is not included in the ongoing restoration of Wooded Island, and thus its own restoration timeline is uncertain. 9. 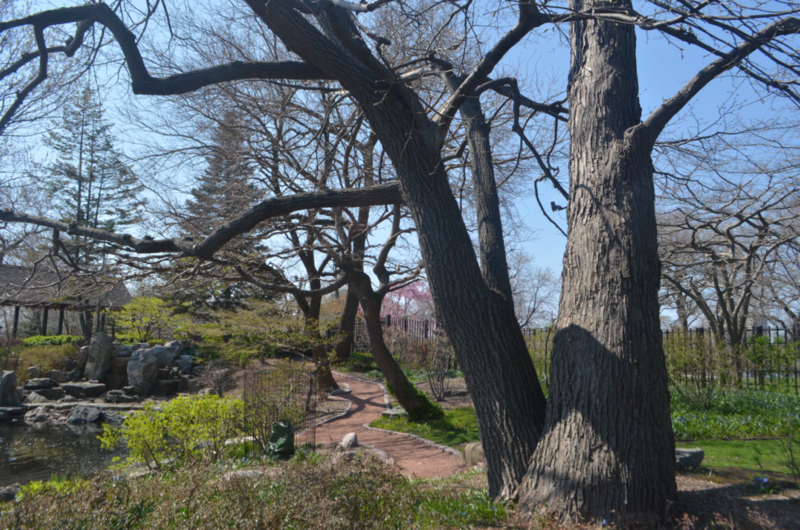 Inside Jackson Park’s famed Japanese gardens we encounter a whole host of non-native trees, as well as fish, particularly koi, that epitomize exactly the kind of organisms Umek and her team want to keep out of Wooded Island. Prior to the restoration, the lagoon was a popular fishing destination among locals, and while it seems that locals and park planners disagree about the kind of fish they want to see in the future, both agreed that carp were not particularly welcome. The park drained the lagoon to kill the carp, with the hopes that their effort would keep those fish out of their lagoon permanently. A fish separator similar to a grate keeps the koi out of the rest of the lagoon, since the non-native koi could potentially pose harmful ecosystem effects to the lagoon-dwelling organisms. However, while the fish separator is large enough to prevent fish from swimming through, the same cannot be said of their eggs. I found this to be a very helpful article. Thank you. Regarding the nature and scope of Project 120, misinformation and confusion abound. Many Hyde Parkers have the impression that Project 120, a private organization, is responsible for most if not all changes and proposed development in Jackson Park. This is wrong. Project 120 is a fraction of GLFER, the unpronounce-able acronym for Great Lakes Fisheries and Ecosystem Restoration that includes three entities, the U. S. Army Corps of Engineers, the Chicago Park District (CPD), and Project 120. Most funding comes from the Army Corps of Engineers and the CPD. From its beginnings in 2014, GLFER has been committed to involving the community in decisions involving Jackson Park, and to that end has held numerous, publicly announced meetings and discussions with various facets of Hyde Park, Woodlawn, and South Shore society. The mission of GLFER has been clearly stated: The simultaneous rehabilitation of the historic park and the ecological restoration of habitat. To that end, GLFER is working with outstanding ecologist Lauren Umek, and has contracted with a national expert on Olmsted’s parks, Patricia O’Donnell of Heritage Landscapes. Concern has been expressed about the construction of a pavilion near the site of the Music Court in Jackson Park. It should be noted that, in her 1972 book, “Olmsted in Chicago,” Victoria Ranney states that Olmsted planned a large Pavilion for Washington Park (near the site of the present swimming pools), that, to summarize, would be a large refectory building, serving meals, surrounded by galleries or roofed promenades. Concerts would be held in front of the Pavilion, and there would be parades, exhibitions, and fireworks. Of course, this was for Washington Park. The Great Chicago Fire prevented its implementation, but a Pavilion in the park seemed like a real possibility at the time.